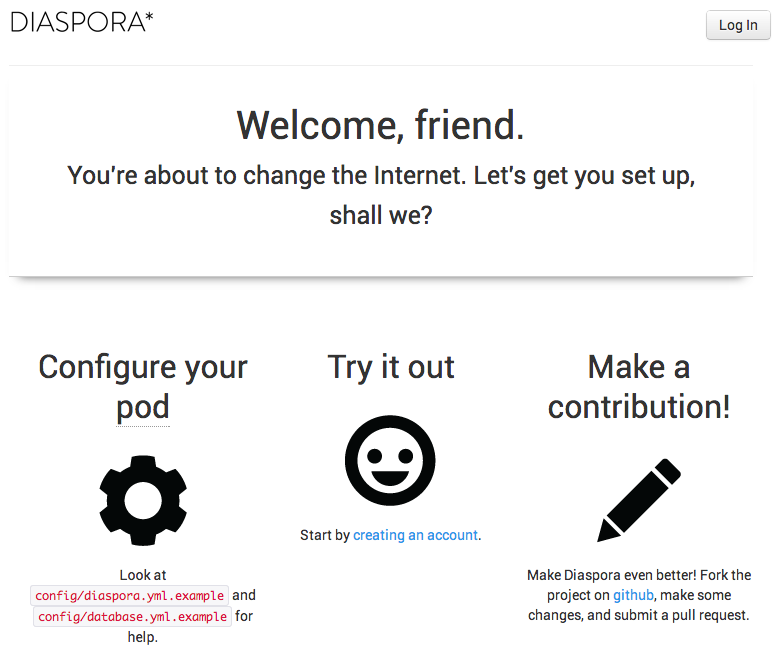 Diaspora is an open-source, distributed social network. Instead of a single company controlling and taking ownership of users' content, Diaspora 'pods' can be hosted by anyone. Pods are typically configured so that users can interact with users on other public pods. If you're running a VPS (droplet) with less than 2 GB of RAM, you'll need to enable swap on your VPS. If you do not do so, some build steps are likely to fail. This tutorial has instructions on enabling swap for CentOS 6. For smaller VPS, add at least 1 GB of swap space. Most steps will be run as a non-root user with sudo access. This tutorial will run you through creating a user account and granting it sudo power. EPEL stands for Extra Packages for Enterprise Linux, and it has some packages we'll need to install that are not part of the base CentOS repositories. Next you will need to install the packages Diaspora requires to build and run. This is the user account that will run Diaspora. You can name this account whatever you like, but this tutorial will assume that this user is called diaspora. Next up is getting MySQL configured for Diaspora. MySQL was installed earlier, but won't yet be running. Start up the MySQL server. First, open up MySQL as root. Now create a diaspora user and the database we'll be using. Type exit to quit MySQL. Set CentOS to start up the MySQL daemon when the server reboots. The next step is to grab the Diaspora source and get it configured to run on your VPS. These commands should be run as the Diaspora user you created earlier. rvm will add some environment setup to the login scripts for the diaspora user; to make sure these are set it's easiest to log out then back in. Use rvm to install the version of Ruby required by Diaspora. Newer versions of Ruby may not be fully supported. Now clone the source code for Diaspora. Enter the diaspora folder that git created. Type y to confirm you want to trust the .rvmrc. Copy the example database configuration file to where Diaspora expects it to be. Tweak the settings in database.yml to match the database you created earlier. Copy the example configuration file so Diaspora will find it. Open this file up in a text editor to edit some of the settings. Find a line starting url: and update this with your server's hostname, and uncomment the line by removing any leading # symbols. A few lines lower, find a line that reads #certificate_authorities: '/etc/pki/tls/certs/ca-bundle.crt' and remove the leading # to uncomment it. A few lines further down, find a line beginning require_ssl. Remove this line's leading # and set the value to false. Ruby will need to fetch and install several gems Diaspora needs. Next build the database schema. echo "Could not touch logfile"
echo "Could not chown logfile"
echo "Diaspora is already running"
echo "Could not run start script"
[ "$VERBOSE" != no ] && echo "Waiting for Diaspora processes... "
echo "Timeout waiting for Diaspora processes"
[ "$VERBOSE" != no ] && echo -n "." [ "$VERBOSE" != no ] && echo "Killing unicorn master with PID $i"
[ "$VERBOSE" != no ] && echo $? [ "$VERBOSE" != no ] && echo "Killing sidekiq with PID $i"
[ "$VERBOSE" != no ] && echo "Starting $DESC" "$NAME"
[ "$VERBOSE" != no ] && echo "Stopping $DESC" "$NAME"
echo "Found unicorn master qith PID $i"
echo "Found sidekiq with PID $i"
echo "Diaspora health is OK"
echo "Unicorn is RUNNING, but sidekiq is DOWN!" echo "Sidekiq is RUNNING, but unicorn is DOWN!" echo "All Diaspora processes are DOWN"
[ "$VERBOSE" != no ] && echo "Restarting $DESC" "$NAME"
[ "$VERBOSE" != no ] && echo "failed to stop"
Now configure CentOS to start this on boot, and run it to start up our VPS. This will start up a Diaspora server listening on your VPS' IP on port 3000, and leave it running in the background. nginx will reverse proxy connections from the web to the Diaspora server. Now open up a new file to create an nginx configuration for Diaspora. Paste in the following content. You will need to update the server_name path to your hostname. Now that the configuration file has been created, restart nginx to pick up the changes. The stop command may fail if ngnix wasn't currently running, but the start command should succeed. Set CentOS to start up the nginx daemon when the VPS reboots. Now that nginx and Diaspora are both up and running, you can navigate to your Diaspora instance and start using it. You can access it by navigating to your hostname with your web browser. You'll be greater with the Diaspora welcome page where you can create your first local Diaspora account.